Map 2 deals with treatment of patients who are physiologically addicted to alcohol (see Section 4 for definitions). Choices down the left side of the flow chart have to do with getting the person into appropriate treatment. Either the person admits to physiological dependence (Section 7) or the dangers are so great that you pressure him/her to go (Section 6), or he/she is willing to consider the issues and go to an alcohol education series (Section 31). These lead – hopefully – into a medical detoxification program (Section 7). Following that, if the patient returns to you, you move on to consider rehabilitation using the choices of Map 3. The choices in the center and lower-right parts of the flow chart have to do with options when the person refuses detox. You can have an intervention (Section 13), which ideally convinces the patient to go for detox. You can treat the person despite his/her physiological dependency (Section 39). This could lead to rehabilitation (Map 4A) and then outpatient psychotherapy (Map 5A), or to therapy without rehabilitation (Map 5A). 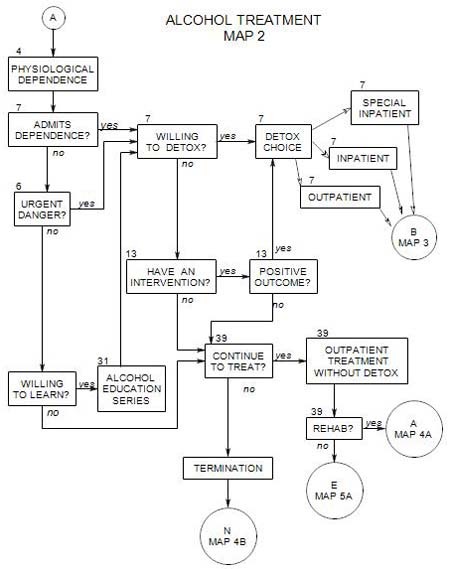 You can terminate the patient (see Map 4B), possibly informing others who will be affected by his/her continued drinking, or possibly working with them instead of working directly the patient.